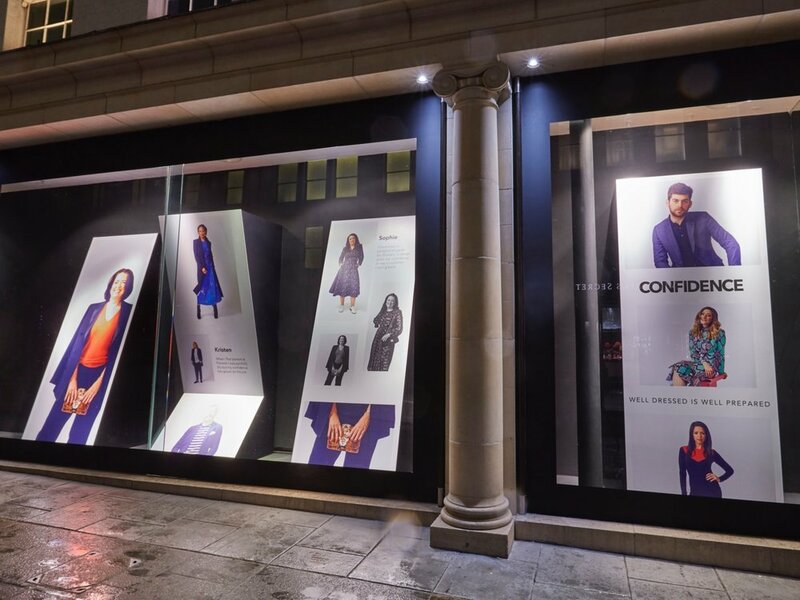 Celebrating all things big or small that create ‘Confidence’ for 2019, Propability were delighted to collaborate once again with Fenwick to deliver two schemes across a number of key stores. The first scheme promoted a range of clothing showcasing how what you wear can make you feel confident. The campaign featured different staff from Fenwick stores wearing the clothes with a photoshoot featured on graphic angled MDF wedges that leant back and forth in the windows the first scheme went into four stores in total including Brent Cross, Bracknell, Bond Street and Kingston. For the second Confidence scheme, Propability created elements for nine Fenwick stores in total, which included different mirrored shapes that were freestanding and although simple – very striking and effective. With everything double sided the mirror sections were created from diabond mirror with two layers stuck together. 150 sheets of mirror were used in total across the stores for window displays that are impactful, create self-reflection and scream you can have confidence in the merchandise and Fenwick brand. Mannequins, clothes.